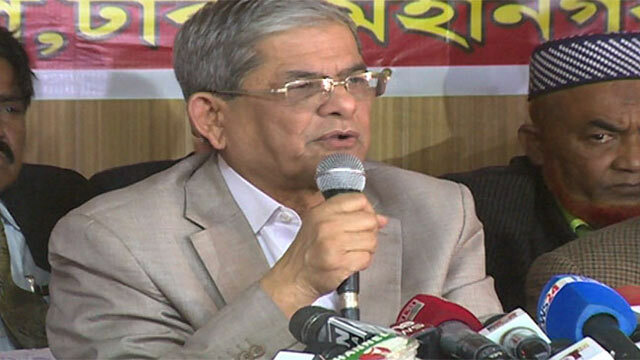 Dhaka, Aug 19 (Just News) : BNP secretary general Mirza Fakhrul Islam Alamgir on Sunday alleged that the ruling party is again ‘plotting’ to keep BNP away from the next general election ‘creating a chaos’ in the country. ‘Awami League doesn’t want BNP to join the polls. They’re trying to put obstacles in the way of BNP’s participation in the election by repeatedly talking about 1/11-like conspiracy,’ he said. The BNP leader came up with the remarks while talking to reporters after placing wreaths at BNP founder Ziaur Rahman’s grave together with the leaders and activists of Jatiyatabadi Swechchhasebak Dal, marking its 38th founding anniversary. He alleged that the ruling party has been on a plot to create a ‘chaos’ in the country to foil people’s efforts to ‘restore’ democracy in the country. Referring to Awami League general secretary Obaidul Quader’s remark that BNP has started hatching conspiracies to create a dangerous situation like 1/11 one in the country, Fakhrul said BNP has no necessity to do it. ‘BNP has no relation with the 1/11 (political changeover). BNP is not in the driving seat now as the steering is in Awami League’s hands. They’ve the experience of 1/11 as they’re its beneficiary,’ he said. Fakhrul said the ruling party is talking about the emergence of another 1/11 like situation involving BNP with an ‘evil motive’. He also came down hard on the government for arresting the ‘innocent’ students involved with quota reform or safe roads movements, and demand the government release all of them before the eid.